Don't miss some quotes and notes from Fred on the QUOTES page! 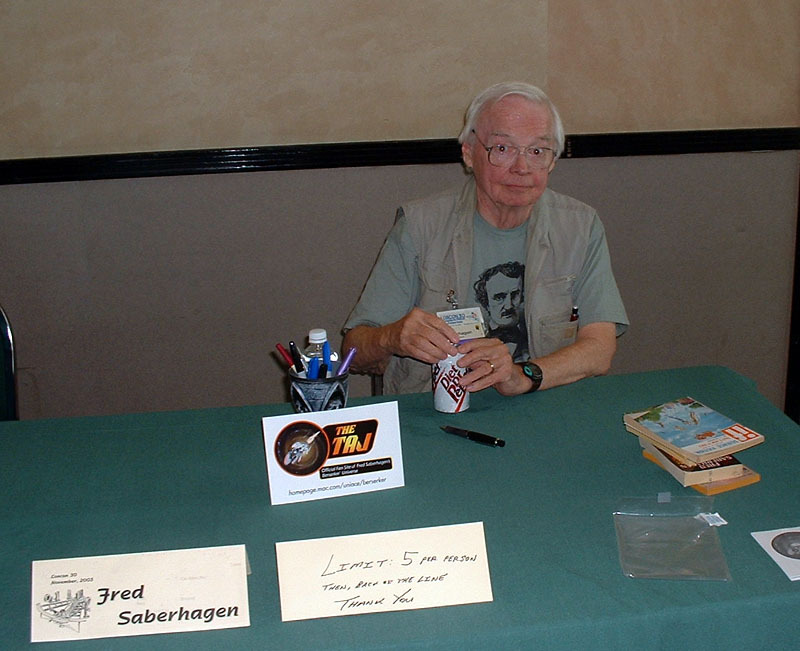 Fred Saberhagen is the author of several popular science fiction and fantasy series. His Berserkers® have menaced the universe for over 40 years and the series had a movie option in the late 90's. Fred's SWORDS and LOST SWORDS stories have caught the imagination of many fantasy readers. Less well known, but equally intriguing are Fred's exploits in the area of historical fantasy where figures such as Hitler and Lincoln, Daedalus and the pharaohs, populate his alternate worlds. On the border of history and fantasy Fred has created a unique picture of an old favorite, Dracula. More recent is the BOOK OF THE GODS series, including THE FACE OF APOLLO, ARIADNE'S WEB, THE ARMS OF HERCULES, GOD OF THE GOLDEN FLEECE, AND GODS OF FIRE AND THUNDER. Before abandoning himself to imagination, Fred served in the US Air Force, worked as a civilian electronics technician, and wrote and edited articles on science and technology for the Encyclopedia Britannica. He now lives and works with his wife in the Land of Enchantment, Albuquerque, New Mexico, USA. Fred was born in Chicago, Illinois, USA on May 18, 1930. Fred's own website may be found here: www.berserker.com (www.fredsaberhagen.com also gets you there, or at least it used to). Here you'll find info about him and all of his various works. You can also find out how to get in touch with him by email; he enjoys hearing from fans and responds to emails with help from his wife Joan, who acts as his techical liaison. FEATURE: The Berserker Series, a short piece of non-fiction by Fred Saberhagen -- another fascinating brief reflection on the series, this one originally published in The Great Science Fiction Series: Stories from the best of the series from 1944 to 1980 by twenty all-time favorite writers (1980) edited by Frederik Pohl, Martin Harry Greenberg, and Joseph Olander. Reprinted with permission exclusively here at The Taj! FEATURE: Berserker Story, a short piece of non-fiction by Fred Saberhagen -- this short reflective piece is a terrific capsule of insight on the series. It was only ever published once: in the Summer-Fall 1977 issue of ALGOL Magazine. Reprinted with permission exclusively here at The Taj! FEATURE: Berserker Empire, an Article/Interview from Starlog Magazine -- a great and wide-ranging article on fred Saberhagen from the October 1991 issue of Starlog, reprinted with permission exclusively here on The Taj! FEATURE: Simply Fred Saberhagen, an Interview by Ken Rand -- a terrific interview covering Berserkers, Dracula, writing science fiction, and more! Hosted with permission right here on The Taj! 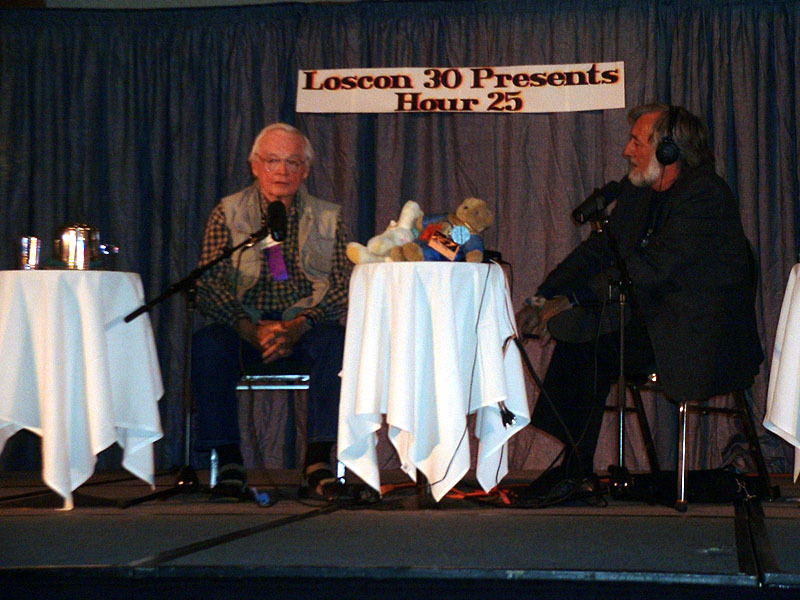 Hour 25 Radio Show - November 28th 2003, live from LOSCON 30, featuring an interview with Fred by host Warren W. James. Link has a synopsis and archived audio. Click here to go straight to the Saberhagen segment (it's an m3u, but links to an mp3 format). 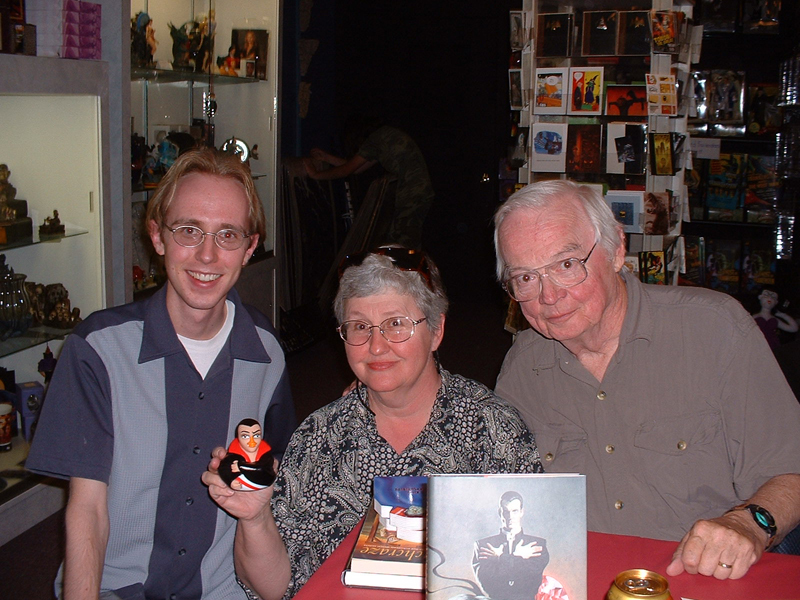 Jason (5th Historian) with Fred Saberhagen Jason with Joan & Fred Saberhagen, and a vampire rubber ducky?! 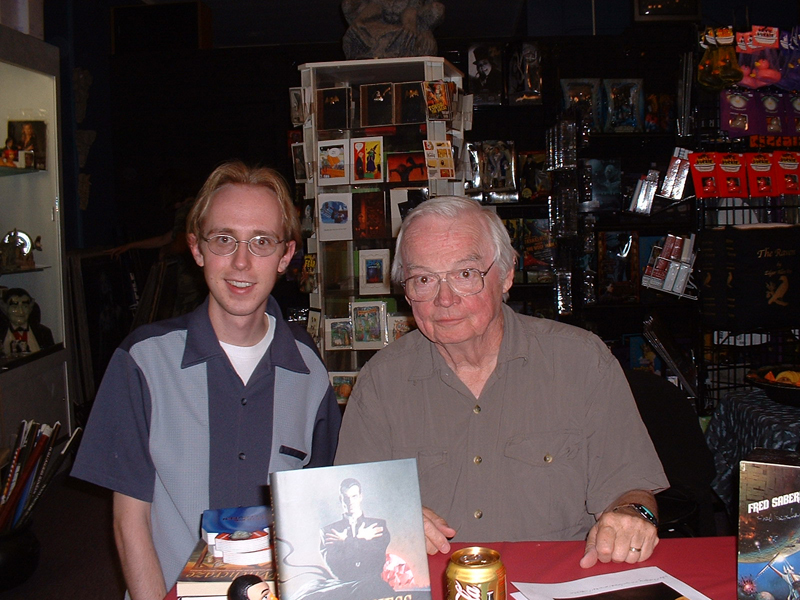 Fred's Guest of Honor Interview, w/ veteran interviewer Rick Foss. Fred's interview for the Hour 25 radio show, w/ host Warren W. James. Archived here. Fred enjoys a nice cold Diet Dr. Pepper in the midst of a busy session of book-signing. (notice The Taj flier!) 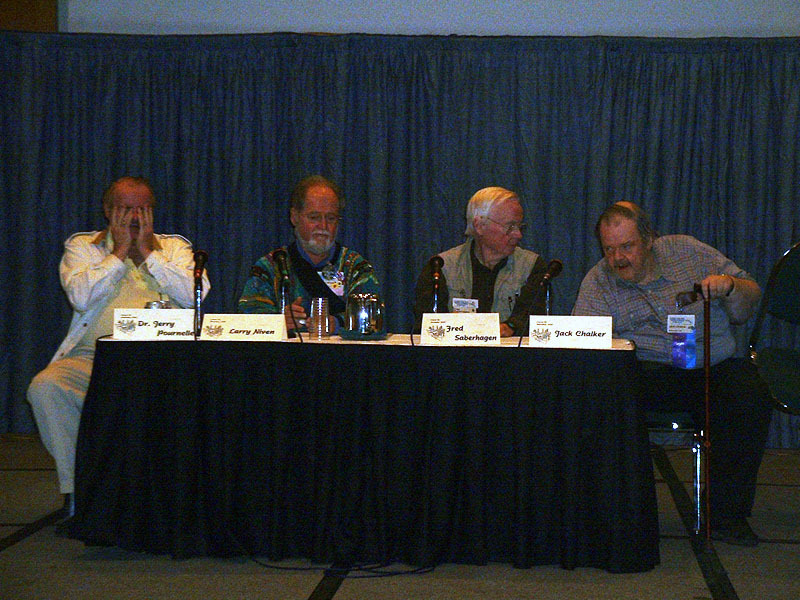 Science fiction authors Dr. Jerry Pournelle, Larry Niven, Fred Saberhagen, Jack Chalker (Fan Guest of Honor) in the panel "Plotting a Series as opposed to a stand alone book." 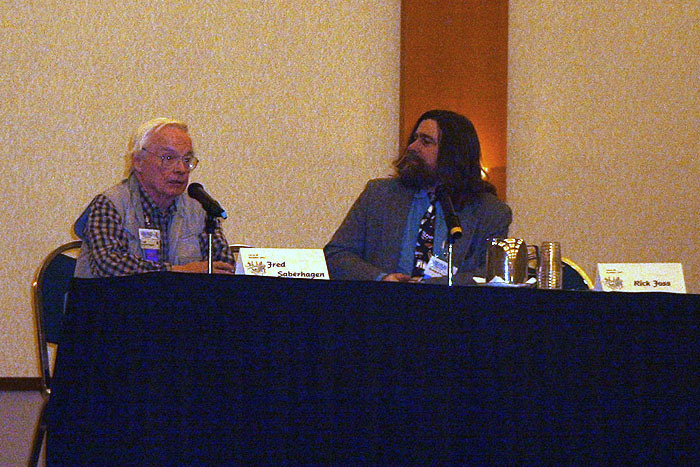 The panelists are joined by moderator John Hertz (center). Artist Guest of Honor Teddy Harvia (aka David Thayer) & wife Diana with Joan & Fred Saberhagen.